Today’s computers can run multiple applications, with scads of windows open in each, without breaking a sweat. That’s generally a good thing, but it has at least one consequence: window clutter, which can make it difficult to find a particular window amongst the crowd. Over the past few years, developers have addressed this issue in a number of ways. 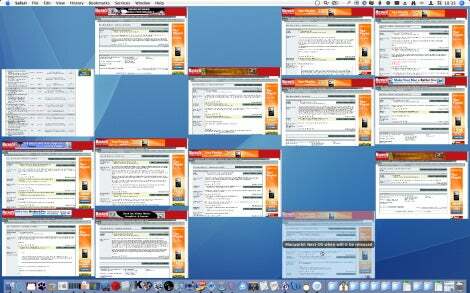 Mac OS X takes an OS-level approach via its Exposé feature, which lets you quickly view all windows (in all applications or just the current app) simultaneously and then choose a window to bring it to the front. Another approach, taken at the application level, is for applications to allow the user to open multiple documents in a single window; for example, many Web browsers have adopted tabbed browsing , which lets you open multiple Web pages within a single window. If you’re a fan of Exposé’s approach to window management, but you also like tabbed Web browsing—and your browser of choice is Safari—check out Cocoamug’s TabExposé 1.1 ($7). Once installed, TabExposé brings a special version of Exposé to Safari’s tabs. By pressing the TabExposé keyboard shortcut (F7 by default)—or by choosing Window -> TabExposé or clicking the new TabExposé button in Safari’s toolbar—an Exposé-like display will show you, laid out across your screen, the Web pages open in the tabs of the current Safari window. Click on a page (or use the arrow keys to select the desired page and then press Return), and Safari will switch to that tab. (As with Exposé, when you move the mouse cursor over a particular Web page, its title is displayed in a translucent overlay.) It’s a handy way to view the contents of each tab if their names (displayed at the top of each tab) aren’t descriptive enough. And, unfortunately, TabExposé has a few limitations and quirks—hence my labeling it a Promising Prospect rather than a full Mac Gem. As noted earlier, the current version works only with Safari. And if you’ve got multiple Safari windows open, TabExposé shows only those tabs in the current (frontmost) window. This can be a good thing or a bad one; it would be great if TabExposé offered a preference for this behavior (current window tabs vs. all tabs in all windows) and then let you hold down a modifier key—such as Option—to toggle the behavior. Unlike Exposé itself, you can’t press the TabExposé key a second time to exit the tab display and return to normal browsing; you need to choose a window. (You can press Escape to exit, but when you do, the browser’s window—title bar, scroll bar, etc.—doesn’t appear until you click somewhere in the window.) Finally, on some pages, pressing the TabExposé key scrolls the currently-viewed tab to the bottom of its Web page before displaying all tabs, which can make it difficult to identify the scrolled page. 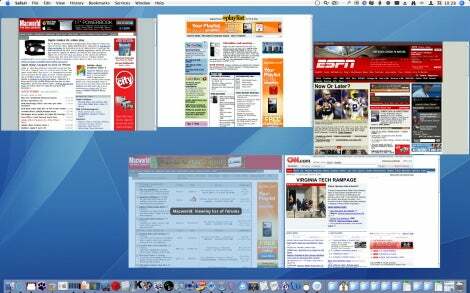 Still, TabExposé is a clever add-on that some Exposé-loving Safari users will appreciate. Hopefully the developer will keep improving its functionality. TabExposé 1.1 requires Mac OS X 10.4 or later and is a Universal binary.